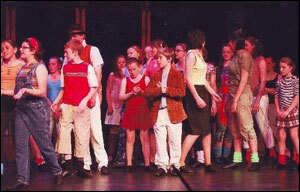 MANSFIELD'S new youth theatre group is celebrating after pulling off a spectacular first show. New Youth Theatre Mansfield staged FAME the Musical to packed audiences over two nights at the town's Palace Theatre at the end of last month. It featured performances by youngsters aged five to 16 and has been hailed a huge success by organisers. Said group founder Neil Butler: "The show was fantastic, everyone did really well and some of the comments the performers received from parents and audience members were very encouraging and complimentary." Neil set up New Youth Theatre Mansfield earlier this year with the aim to provide children with a platform to showcase their talents. The group gives youngsters a taste of the 'whole' theatre experience, where they can help to put on different shows and play all parts �� with each show focusing on different age groups. Following the success of FAME, the group is expanding its classes in September and will be working on two productions to be performed at the end of November �� Oliver and Jungle Book. Oliver is aimed at 5-16 year olds and the Jungle Book is aimed at the younger performers, aged 3 � 11. Taster sessions for the groups are being held on the 16th August and to book a space call Neil Butler on 01623 406284 or visit www.newyouththeatre.co.uk/mansfield. In addition New Youth Theatre is running some High School Musical Workshops in the summer. The events are being held on 3rd August (age 5-10) and 10th August (age 11-16) with details also available from Mr Butler.